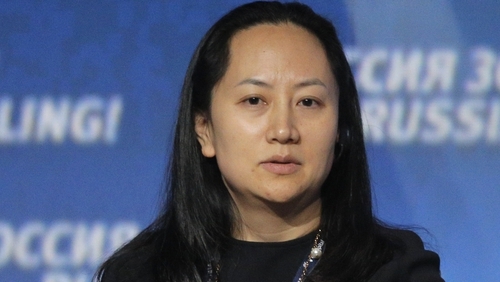 A top executive and daughter of the founder of Chinese telecom giant Huawei has been arrested in Canada and faces extradition to the United States. The move has angered China and comes just days into a trade war truce with the US. The detention of Meng Wanzhou, Huawei's chief financial officer, comes after US authorities reportedly launched an investigation into suspected Iran sanctions violations by Huawei. The company was already under scrutiny by US intelligence officials who deemed the company a national security threat. The arrest has led to tension just as the US and China agreed to a ceasefire in their trade spat while negotiators seek a deal within three months. News of her detention rippled through stock markets in Asia, particularly Shanghai and Hong Kong, with tech firms among the worst hit. Ms Meng was arrested in the western city of Vancouver on 1 December, Canada's ministry of justice said in a statement. The ministry said the US is seeking her extradition and she faces a bail hearing tomorrow. It said it could not provide further details due to a publication ban that was sought by Ms Meng, whose father, Huawei founder Ren Zhengfei, is a former Chinese People's Liberation Army engineer. The arrest occurred on the same day that US President Donald Trump and Chinese President Xi Jinping struck the trade war truce at a summit in Argentina. Explainer - Why is China's Huawei Technologies controversial? China's embassy in Ottawa demanded Ms Meng's release. Huawei said it was unaware of any wrongdoing by Ms Meng and was provided "very little information" about the charges. "Sometimes Chinese aggression is explicitly state-sponsored and sometimes it's laundered through many of Beijing's so-called 'private' sector entities that are in bed with Xi's communist party," he added. A month later, the US and China reached a deal that would strike ZTE from the sanctions list. It came just days after China reportedly offered to ramp up purchases of American goods to help cut the yawning trade imbalance with the US. American officials denied any connection between the two.